We’d love your help. Let us know what’s wrong with this preview of The Nature of Space and Time by Stephen Hawking. Einstein said that the most incomprehensible thing about the universe is that it is comprehensible. But was he right? Can the quantum theory of fields and Einstein's general theory of relativity, the two most accurate and successful theories in all of physics, be united in a single quantum theory of gravity? Can quantum and cosmos ever be combined? On this issue, two of the world's most famous physicists--Stephen Hawking ("A Brief History of Time") and Roger Penrose ("The Emperor's New Mind" and "Shadows of the Mind")--disagree. Here they explain their positions in a work based on six lectures with a final debate, all originally presented at the Isaac Newton Institute for Mathematical Sciences at the University of Cambridge. To ask other readers questions about The Nature of Space and Time, please sign up. "I have emphasized what I consider the two most remarkable features that I have learned in my research on space and time: (1) that gravity curls up space-time so that it has a beginning and an end; (2) that there is a deep connection between gravity and thermodynamics that arises because gravity itself determines the topology of If you're into stuff like this, you can read the full review. "I have emphasized what I consider the two most remarkable features that I have learned in my research on space and time: (1) that gravity curls up space-time so that it has a beginning and an end; (2) that there is a deep connection between gravity and thermodynamics that arises because gravity itself determines the topology of the manifold on which it acts". In “The Nature of Space and Time by Stephen Hawking and Roger Penrose” by Stephen Hawking in the lecture "Quantum Cosmology"
"We should think of twistor space as the space in terms of which we should describe physics." 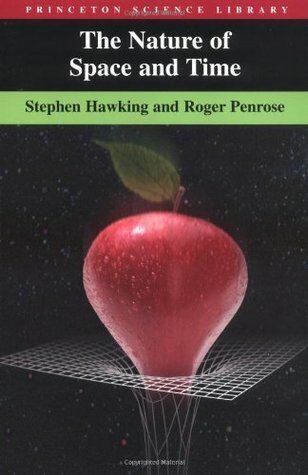 In “The Nature of Space and Time" by Stephen Hawking and Roger Penrose by Roger Penrose in the lecture "The Twistor View of Spacetime"
"These lectures have shown very clearly the difference between Roger and me. He's a Platonist and a positivist. He's worried that Schrödinger's cat is in a quantum state, where it is held alive and held dead. He feels that can't correspond to reality. But that doesn't bother me. I don't demand that a theory correspond to reality because I don't know what it is. Reality is not a quality you can test with litmus pap. All I'm concerned with is that the theory should predict the results of measurements. Quantum theory does this very successfully. It predicts that the result of an observation is either that the cat is alive or that it is dead. It is like you can't be slightly pregnant: you either are or you aren't." In “The Nature of Space and Time" by Stephen Hawking and Roger Penrose by Stephen Hawking in the lecture "The Debate"
لفت نظري في الكتاب في هو انتقاد هوكنج لنظرية الأوتار الفائقة وهو أمر أقرؤه له لأول مرة وإن كان نقدًا سريعًا في سطر واحد فإن كان لاذعًا حيث اختار عدم طرح النظرية لسببين الأول هو أنه لا توجد مشاهدات تؤيدها والثاني أنها غير واضحة أو جميلة رياضيًا. 1. ...ma almeno è in italiano? 6. *arrivata a pagina 130* "
Considerably more technical than either Hawking or Penrose's lay material (A Brief History of Time etc.) If you're seeking an introduction to the controversy behind Hawking's quantum gravity speculations (Hawking radiation, the no-hair theorem) then this is a good start. Is quantum information lost in black hole evaporation? There are still no solid answers to the questions posed here. Up front: this book is not for everyone. I’m actually not certain it was for me. I haven’t really studied physics since the courses I took in the early 1990s in university. This was originally written a few years later, but assumes more than merely a rough knowledge of Relativity and Quantum mechanics – you actually need something more than just a basic introduction to really grasp what’s going on here. But, armed with the internet, I persevered, more or less. The science may be a bit dated, but s Up front: this book is not for everyone. I’m actually not certain it was for me. I haven’t really studied physics since the courses I took in the early 1990s in university. This was originally written a few years later, but assumes more than merely a rough knowledge of Relativity and Quantum mechanics – you actually need something more than just a basic introduction to really grasp what’s going on here. The science may be a bit dated, but since the book is 20 years old, that shouldn’t be too surprising. It’s also hard to tell without more physics, and more recent physics, than I have. As a result, this is going to be a rather shorter review than I often write. Hawking and Penrose are having a friendly conflict about the nature and structure of the universe. This is not a book for generalists or people with a passing interest in relativity and quantum mechanics. While the authors assume you have a basic familiarity with the relevant mathematics and quantum mechanics, I might suggest that basic familiarity is more along the lines of post-graduate. This book was recommended to me by a good friend a while back, who insisted I purchase my own copy because he couldn't stand to part - even temporarily - with his. So I did. Maybe a month later, co-author Sir Roger Penrose spoke at a local university and I was fortunate enough to see him, as well as have my very untouched copy of The Nature of Space and Time signed by him. Only recently did I read it, and I'd be lying if I said I could comprehend more than half on my own. Reading this book, more This book was recommended to me by a good friend a while back, who insisted I purchase my own copy because he couldn't stand to part - even temporarily - with his. So I did. Maybe a month later, co-author Sir Roger Penrose spoke at a local university and I was fortunate enough to see him, as well as have my very untouched copy of The Nature of Space and Time signed by him. Only recently did I read it, and I'd be lying if I said I could comprehend more than half on my own. Some of this information is dated, which is to be expected reading it so long after it was written. I could follow most of the math, but was disappointed by the lack of variable definition. Penrose's writing was much more clear than Hawkings and I believe I'll search out some of his writing on the topic the next time I approach this subject. And all those mathematical equations and terms like Lagrangian and Eulers numbers which I learned in calculus back in undergrad emerged. A very technical read - I skimmed through most of it and highlighted the 'absorbable parts'. More Stephen Hawking in the future for me! Lots of diagrams. Has a lot of loaded philosophical statements that were useful when writing a thesis. Helps to explain singularity, cosmic censorship, etc. I found the information in this set of 3 lectures to be somewhat interesting but because I am not a student (or practitioner) of science I found it to be a bit too specific to the field of physics/quantum mechanics/advanced maths/etc. for my general interest. I gave it a good college try, but was immediately swamped by the intense theoretical physics and deep mathematics involved. As a series of lectures between the two physicists as they voice disagreements about the nature of the universe, it was interesting to be a sort of fly on the wall, to see what these big brains talk about when the rest of us aren't around. On the other hand, they're discussing these things at their own level and not the level of a layman, so one might as well be a fly on th I gave it a good college try, but was immediately swamped by the intense theoretical physics and deep mathematics involved. As a series of lectures between the two physicists as they voice disagreements about the nature of the universe, it was interesting to be a sort of fly on the wall, to see what these big brains talk about when the rest of us aren't around. On the other hand, they're discussing these things at their own level and not the level of a layman, so one might as well be a fly on the wall for the comprehension of the subject is concerned. Un libro sólo para especialistas. Repito, sólo para quienes tengan conocimientos de las matemáticas de la relatividad general y los fundamentos de la mecánica cuántica. No hace falta ser experto en gravedad cuántica para seguir las argumentaciones, ni mucho menos. De hecho, cuando Hawking habla para otros físicos es un divulgador de primera, capaz de presentar temas abstrusos de un modo claro y conciso, todo lo contrario que hace en sus nefastos libros de divulgación popular. Y Penrose saca much Un libro sólo para especialistas. Repito, sólo para quienes tengan conocimientos de las matemáticas de la relatividad general y los fundamentos de la mecánica cuántica. No hace falta ser experto en gravedad cuántica para seguir las argumentaciones, ni mucho menos. De hecho, cuando Hawking habla para otros físicos es un divulgador de primera, capaz de presentar temas abstrusos de un modo claro y conciso, todo lo contrario que hace en sus nefastos libros de divulgación popular. Y Penrose saca mucho partido a la notación de brakets, por ejemplo. Pero es imprescindible tener conocimientos al nivel de licenciatura de relatividad general y cuántica. As much as I enjoyed the concepts that were meticulously laid out in this book; it hurt to read. The book required a lot from the reader to understand and keep up with the complex theories, unless of course you brought along your PHD in experimental physics and cosmology, which I did not. Not good. Notes from a Cambridge series of lectures. Colloquium level for PhDs in Quantum Gravity and Cosmology. Terms are not explained. Equations are not explained. Familiarity with 4 spheres, deSitter spacetime, Euclideanization of spacetime is assumed. I am not sure how some read this book, but as an undergrad physics student, all I could read are the first couple of pages before the 1st equations. Yet another Great book by Stephen Hawking! Extremely nice and clear book. It may be better especially if one knows well about the subject matter, as it is written more in debate format. Interesting but extremely, extremely confusing.